I created a set of API docs with Apiary using Markdown format. We needed to change over to Postman, so I used Apimatic for the conversion. Which was 99% great, except for the item descriptions it only did a single line break, not two line breaks. As Postman is reading the description as Markdown a single line break doesn’t actually create a new line. So, I needed to replace the string \n with \n\n but the key is I only needed to do it on the description field. Ohh and I needed to add an x-api-key to use the mock server. Even Postman’s own authorisation system didn’t seem to easily support this. 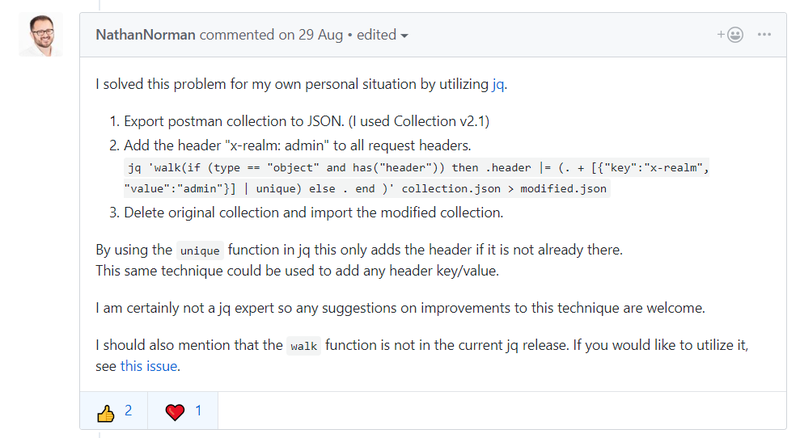 Using the incredibly useful comment by NathanNorman on this GitHub Postman issue I had a glimpse of what I could do. I then checked some resources, learnt about the |= update operator and gsub for replacement. If you want to see a list of the updated description fields to make sure it worked you can pipe the results to jq again. Hopefully that helps others, or myself in the future. Note that I downloaded the latest version of jq in order to run this. The debian distros are only using version 1.5 but I needed v1.6 for the walk function, but it’s a pretty easy download. https://stedolan.github.io/jq/manual/#walk(f) – Official docs description of the Walk function in jq. https://www.apimatic.io/transformer – The very powerful API blueprint online conversion system. Allowing me to upload a Markdown style Apiary file and download a Postman and also Swagger .json files.